The San Jose Police Department has an exciting 160 year history that I was proud to be a part of. I spent twenty-seven years in law enforcement, most of them policing the streets of San Jose. Drunks, con artists, counterfeiters, thieves, robbers, child molesters, rapists, sexual predators, murders, and terrorists. These are the people I have dealt with over the years. These are the people I have arrested. These are the people I’ve sat across from in interrogation. 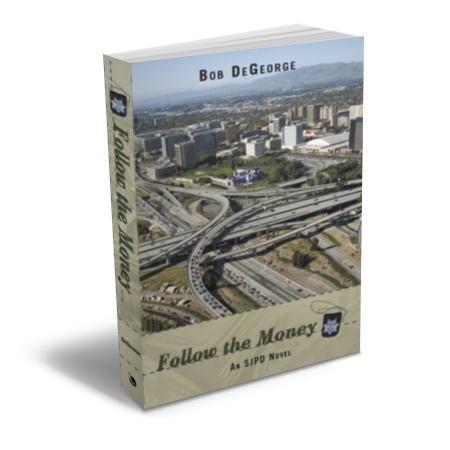 Follow the Money is all about San Jose and the brave men and women of the SJPD. It is a story of what did happen, what might have happened, and what could have happened, give or take a lie or two. As two seasoned SJPD detectives, Rex Johnson and Kat Sanchez, Follow the Money, you will step into the world of the SJPD. Ride along with these two detectives as a routine investigation turns more and more complex and more and more deadly. Their investigation leads them to a shadowy Vietnamese underworld boss who views himself as a modern-day Al Capone. He is a man who will stop at nothing to preserve his criminal empire. With a Chief of Police more interested in his political ambitions, with a City Hall more interested in the revenue generated by gambling, and with supervisors more interested in a quick case closure than a solid investigation, Rex and Kat find themselves fighting their own department as much as the criminals. It all leads to one explosive, gut-wrenching life or death confrontation as Rex and Kat come face-to-face with international terrorists who are intent on retaliation-regardless of the personal cost to two detectives sworn to serve and protect the citizens of San Jose. This is the first book in a series involving Rex and Kat. I hope you like it. Please tell a friend. This entry was posted in Uncategorized and tagged Bob DeGeorge, crime novel in San Jose, Follow the Money, police detective novel, San Jose Police novel, SJPD Novel. Bookmark the permalink.